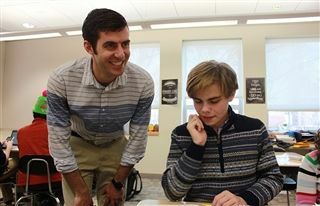 Upper School Mathematics teacher Alex Hoerman believes all of his students will succeed in their lives after KO. From college to internships and travel opportunities, the door, he says, is wide open. But what about life after college? What life’s challenges will face our students in their adult lives? Life, the students found, does exist after college. But, life can certainly be expensive. 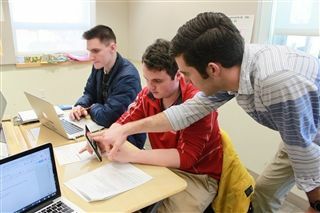 Braden Rose ’21, Molly Jones ’20, and Julia Kanaan ’20 sat together at the front of the classroom, hastily crunching numbers into their graphing calculators and jotting down their results. Each student researched and selected practical considerations for their future education, employment, housing, and transportation. Rose envisioned moving to Boston post-law school and renting an apartment in the North End while saving for the downpayment on his first home. He said he experienced quite a sticker shock after some virtual apartment-hunting, but set a strategic plan for saving in other ways. Jones mapped our a similar pathway to Beantown, with plans to attend Harvard Medical School followed by a career as a cardiothoracic surgeon. She selected a house through Zillow in Jamaica Plains, instead of downtown, in an effort to cut costs. She also chose to forgo a car, instead opting for public transportation. “It’s a lot less considering a monthly T-pass is only about $100 a month,” she said. Kanaan planned on becoming a pediatric pulmonologist, earning $72,000 dollars as a first-year resident living near Boston. In an effort to be cost conscious, she earned her degree at UCONN Medical School so she would qualify for in-state tuition. “I picked an expensive $600,000 house though,” she said, of her post-grad residence. Hoerman circulated throughout the class as the students worked through their calculations, stopping by each group to answer their questions and guiding them to uncover the answers by themselves. “Why do you think?” prodded Hoerman. Hoerman said that one goal in the class is to understand how interest plays for you and against you when you take out a 30-year mortgage. 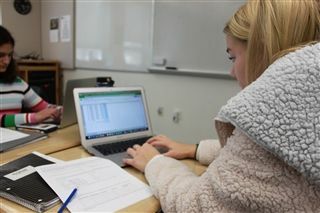 The class also inputted their expenses into Excel spreadsheets, and Hoerman noted that using the software was yet another practical skill to master in addition to learning the harsh truth about managing money and taxes. Rose had “purchased” a BMW and realized after the assignment that he was in the red monthly. “Maybe I should start with a bike,” he considered. 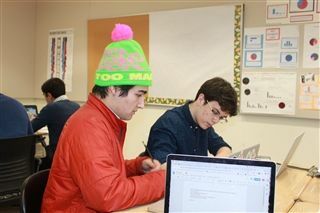 Precalculus is an Upper School math course that provides students with a foundation for continued studies in calculus, statistics, or other quantitative courses in college. The major focus of this course is solving and graphing equations in each family of functions (rational, exponential, logarithmic, etc). Through a graphical, algebraic, and numeric approach, students develop a strong conceptual understanding of problems, mathematical reasoning, and problem-solving ability.